4 out of 7 members found this post helpful. Very interesting, had a lot of stuff I never knew about before in this video. 6 out of 11 members found this post helpful. Let me guess, they were Albanians? 0 out of 4 members found this post helpful. That's so interesting considering how I myself was very harshly scolded by certain members here only a few weeks ago for basically positing that I don't think it's as of yet implausible (and therefore this should be further investigated) that the specific Illyrian dialect (not the people who spoke it necessarily, since languages can diffuse with minor genetic flow) that would give rise to modern Albanian (or at least influenced its dialectal development a lot) could hypothetically have originated roughly in the region between Dardania, southern Moesia Superior and northern Paeonia, in and around modern Kosovo, where there are evidences of "Albanoid" changes in placenames and Albanian-like etymology for toponyms. People thought I was somehow "stealing the land from the Albanians", saying complete nonsense or whatever. But then this apparently "politically acceptable" video comes and claims precisely that Albanians derive from Dardanians, that the "core" Dardanians came originally from precisely that region near Naisssus/Nish, and that by the time of Bardylis extended their political/cultural dominance over as deep south as Epirus. I fail to see what's the big difference, perhaps except for the fact the video's hypothesis would've taken place some centuries earlier than I thought. Or maybe, who knows, people really think that a completely uniform dialect was spoken in lands 400-450km apart from each other for many centuries without ever diverging into different versions of the proto-language, so that apparently discussing the origins of a specific modern language in an ancient dialect continuum is totally useless. The issue, was with claiming a medieval entry of Albanian into the more southern territories, which again, doesn't make sense when we consider the 7th century bc laconian folk vocabulary having albanian word loans. Lazaridis said Albanian seems to have translocated southwards in medieval times like vlach and slav languages. This was the crux of my disagreement, which I still stand by. Dardania AND Epirus had Albanian speakers, toponyms like Dimallum (related to Albanian "Mal" (mountain) and stuff like that has convinced me of that. This inclusion of Epirus is a big difference for me, if its not for you i wont hold it against you, but i will disagree and ask for your evidence against it. My objections to Matzinger were based on his entire argument being built around negative evidence i.e. lack of toponym continuity is his main argument, despite being very weak argument his way around since we know how turbulent balkan history is, whereas the presence of even one toponym having continuity is on the obverse a much stronger argument since its possible to have albanian speakers not in power (i.e. kosovo, serbian was official language, official maps using serbophone toponyms, etc) while living there, whereas having one toponym show continuity necessitates Albanian speakers there. 2 out of 6 members found this post helpful. So Dardanians (Albanians) were Trojans and in turn mythical founders of ancient Rome? How they explain the chronology of the few ancient Greek borrowings at which time were borrowed? From what i have read can not be established the time when were borrowed. west greek doric contact zone between albanian and greek is likely where they would have picked it up. Epirus is the most suitable candidate. Time to learn little more history. explained well if Illyrian homeland was Noricum. Well, according to Greek mythology, Illyrius was the youngest son of Cadmus and Harmonia who eventually ruled Illyria and became the eponymous ancestor of the whole Illyrian people. So, where is the difference between Illyrians and Dardanians according to you ? I think that, as already seemed likely from a "linguistic and historic common sense" point of view, if the myths have a grain of truth then it could be established that "Illyrians" did not form a homogeneous ethnicity and language community, they were rather more like "the Latins" or "the Slavs" nowadays, an umbrella-term for several different populations that speak languages that are perceived as much more related between themselves than to other neighboring peoples' languages. People did not manage to expand so much from Croatia to Epirus and elsewhere and still retain the homogeneity of their language preventing any linguistic divergence, especially in the Antiquity without modern means of transport and communication, let alone a political centralization and strong state institutions. That could only happen if we assumed that Illyrians were very recently settled in the Balkans by the time the region was conquered by the Romans... but that doesn't seem likely at all. My main quibble with Johane Derite's assumption that as early as the 7th century B.C. Epirus was already "Albanian-speaking", but Dardania was also probably "Albanian-speaking" according to him, is exactly that I find it highly unlikely that such a far-reaching language would've remained that homogeneous by the time of the Roman Empire. Granted, some distinctively "Albanoid" sound rules (phontic changes) may have spread like fire through a large area, as areal features may encompass even different language families, but that is totally different from stating that the language was exactly the same in all that region from the northernmost to the southernmost point, and that the Modrn Albanian dialects derive seamlessly from all of that speech community from Dardania to Epirus indistinctly. For instance, we know that Greek was spoken in a much wider area, but Modern Greek in fact does not come from all those dialects, it's clearly a derivation of koiné Byzantine Greek which in turn came from Attic Greek. The other ancient dialects died out, they either shifted to or re-converged significantly to Koiné Greek, except maybe for Tsakonian, which may come from Doric Greek. A similar thing must've happened in the Albanian-speaking territory, otherwise after more than 2700 years you'd certainly expect an even much wider linguistic diversity, more than in the Germanic languages. But that was never my claim. I was thinking more of the Roman eraand of the root of the proto-language, not the Illyrian/Albanoid speakers as a whole. I gather that by "Albanian loanwords" what can really be said is that, if Albanian is indeed Illyrian, then some Illyrian dialect/language was spoken as south as Epirus and as north as Dardania (and of course even more to its northwest). But I'm not as sure as you that that meant the direct ancestor of Modern Albanian dialects was spoken indistinctly in both Dardania and Epirus as early as the 7th century B.C, somehow preventing further linguistic divergence for some 2600 years in the absence of any common strong state that could've forced a relative homogeneization of the language (but even in that case that would certainly have meant the imposition of one specific dialect of that linguistic area over the other dialects, shifting to a common language based on one among many dialects). In my opinion, the present state of the Albanian language points out to a split from Proto-Albanian (the last common ancestor of all modern dialects) not as early as the Classical Antiquity, but in the Late Antiquity, roughly the Late Roman Empire. That would've necessitated many centuries since the 7th century B.C. (and we can't even assume that the Illyrian language was that recent in Dardania and Epirus that it wouldn't have started to split already by then). Now, of course part of the original Albanoid-speaking community would've become Romanized, and others would've moved away from the Romanization to others more "untainted" lands, so I presume that must've had linguistic implications, and one or a close set of similar dialects must've prevailed over the others. What I find really hard, from basic common sense, is that the modern language derives seamlessly from a language spoken homogeneously and indistinctly from Dardania to Epirus (or even elsewhere) as early as ~600 B.C., when you yourself pointed out to me that some linguists date the start of the split of modern Albanian dialects to 300 A.D.
Where did you see Bardylis ? 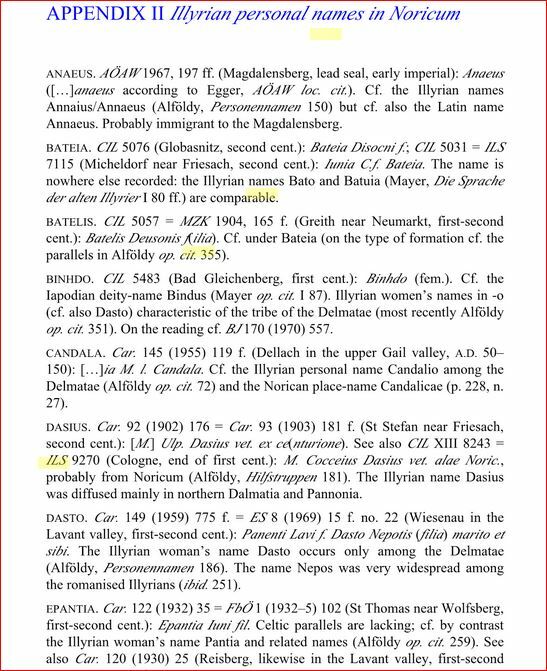 About the name Bardylis,don't know exactly when Albanian switched PIE ǵ- to dh,but in proto-Albanian would have sounded more like "bardza" not "bardhe" from bʰrh₁ǵ- compare English "bright".So i think that is another thing what should be explained by linguist when comparing ancient names to modern languages. I'm trying to understand what you wrote. Can you provide some more info that is easy to understand for people who can't read those symbols? A is similar to - "pluck" or "up" but more similar to Boston accent - "father"
DH is like the first sound of "the" or "there"
Could you explain in a similar way how you think BARDH was pronounced in proto-Albanian? And could you provide some evidence for that opinion? Thank you! From what i can find linguist think probably that PIE "g" become "dz" in proto-Albanian and then "dh". Hes trying to argue that the proto form of bardhe wouldnt have been "bard" but i disagree. It all depends in the chronology. Its obvious these "Bard-" names in illyrian and messapian are related. There is also the messapic city "bardulos" which linguists belive means "grey". Obviously a cognate. Since we have literal documented use of this word, the actual source should take primacy, and not the speculated transitional phoneme which is the opinion of a linguist or two. The Dardanians were most likely are our ancestors. Yes. Makes as much sense if not even more as the Bessi theory proposed by Schramm. But people will push whatever suits their agenda. Dardanians were probably a Thracian Ilyrian hybrid but Strabo puts them as Ilyrians. They were neighors of the Thracian Bessi and Ancient Macedonians. Probably where the word 'Bes' in Albanian stems from. A common origin. I disagree, but I wasn't thinking about those Dardanians when I made that comment. The Dardanoi were most likely Luwian judging by the single inscription and the material culture. Thank you. I don't know a lot about etymology, but I see you are saying that PIE "g" became "dh". For this to mean that the "Bardh" of today was "Barg" at 400 BC, two scenarios have to be excluded. First, assuming your "g">"dh" argument is true, it might be that the Dardanians had already been through that process. Keep in mind that Bardylis lived around 1500-1700 years before documented modern Albanian "dh" and around 3000 years after the possible PIE "g". Second, it could be that some "dh" came from "g" but some other "dh" came from "d" or something else. So it has to be that all modern "dh" came from "g" and nothing else. Do you have any argument to exclude these two possibilities? It is Skenobarbus i think so,but some linguists already suggested see Enlglish "beard",proto germanic bardaz. I wouldn't be surprise if some of the other names with "bard" have similar root.